Developed specifically for BMWs N54 twin turbo motor, as found in the BMW 135,335 and 535 models, Forge Motorsport adds another replacement valve application to our already extensive vehicle specific and universal valve lineup. While virtually identical in operation to the Bosch style valves as used from the factory on many other turbocharged applications, primarily Volkswagen and Audi, BMW has utilized a very different type of valve connection mechanism that makes their product and our replacement components very unique. The entire valve assembly is precision CNC machined from T6-6061 billet aluminum alloy on our very own Mazak CNC milling machines. Again, the valve is an aluminum piston based design, offering significantly improved reliability over the failure prone OEM diaphragm valves, yet with no change to valve response time. We utilise ultra high temperature Viton brand silicone o-rings for sealing and Mobil1 fully synthetic bearing grease for lubrication. The valves are fully tunable for both boost holding capacity and response, by way of proprietary interchangeable springs. By utilising this method of valve tuning with multiple custom spring rates, the valves will retain the maximum range of piston travel and flow volume regardless of which spring rate is used. Valves with a singular spring requiring that adjustments be made by continually adding preload will suffer from decreased piston or diaphragm travel as the spring tension is increased. Though these types of valves may hold high boost levels under load, they will actually suffer from limited flow volume at throttle lift when the valve vents. The hoses included in the kit are a custom made multi-layer fabric reinforced flexible silicone hose that are designed to allow compatibility with the stock airbox and charge piping setup without any permanent modification being required to adapt our replacement valves. Even the included hose clamps are overkill. They are specifically designed for use with silicone hoses, utilizing a beveled band edge and a pressed in drive mechanism rather than perforated. They are even approved by NATO for international military use. 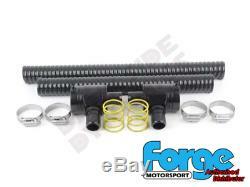 All told, this direct replacement valve kit will be suitable for a bone stock car to one that is heavily modified. They can be installed on the car right on the showroom floor and they will last well past having upgraded your intake, exhaust, and ECU software. In The Box: 2 x FMDVBM35 Valve (Left and Right) BLACK VALVES 1 x 25mm x 400mm Mega Flex Hose 1 x 25mm x 330mm Mega Flex Hose 4 x 40mm Hose Clamps 2 x Uprated Yellow Spring 1 x Forge Sticker. We use DPD 24hr service. Despatch times can vary, depending on what you have ordered. But if the item is going to be delayed longer than 24 hours we will contact you. The item "Forge Motorsport Recirculation Valves BMW N54 Twin Turbo 135 335 FMDVBM35 BLACK" is in sale since Monday, November 12, 2018.